This battery charger is a microprocessor controlled unit designed exclusively for charging a 1.8 A-hr., 14.4 V. Lithium-ion battery pack. It has three led indicators to indicate the current operating mode of the charger. It is capable of providing a full charge in approximately 2.5 hours. 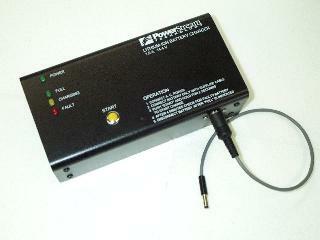 This battery charger complies with applicable safety agency requirements. Input Voltage: 90 - 240 Vac, 50/60 Hz. Fuse: 5mm X 20 mm IEC Sheet III (time-lag) fuse, 1.6 A, 250 V.